Art galleries are everywhere, but there’s a lot more beyond that world. The India Art Fair has become a pilgrimage of sorts for art lovers in the country as well as abroad offering insights into cultural landscapes and initiating dialogues on various states and cities. This year the fair aims to discover modern and contemporary art from South Asia, presenting 75 exhibitors from 24 Indian and international cities. Featuring a diverse selection of contemporary art galleries from across India, the fair will also continue its tradition of presenting works by leading modernists like FN Souza, Tyeb Mehta, Raja Ravi Varma, Akbar Padamsee, and Ram Kumar. Jagdip Jagpal, Fair director, said that throughout the fair, visitors will encounter eleven art projects, ranging from large-scale interactive installations, to sculptures and video works. There will be many artists showcasing their respective presentations under the section. Self-taught artist Baaraan Ijlal will present her sound installation titled, Change Room. Artist Manisha Gera Baswani will be exhibiting her series titled, Postcards from Home, which details accounts from those affected by Partition. Among other artists, there will be Galleryske, which will create a pop-up concept store offering artist-designed products. There will be works by sculptors Shanthamani Muddaiah and Shalina Vichitra, alongside an immersive reflection from architect Pinakin Patel. Artist Madhusudhanan will be presenting a few of his video works. This year’s edition also welcomes back TAF: Tribal Art Forms, Delhi Crafts Council, Blueprint 12, and Swaraj Art Archive as well as Britto Art Trust of Dhaka, Bangladesh, under the section titled Platform, that also acts as springboard for emerging art collectives from South Asia. Leading cultural organisations and foundations from the South Asia region will include the Foundation for Indian Contemporary Art (FICA), Kiran Nadar Museum of Art (KNMA), Museum of Art and Photography (MAP), and the Bengal Foundation of Dhaka. There will also be Inlaks Shivdasani Foundation, which will show works by recipients of the Inlaks Fine Art Awards throughout the fair. These will be joined by New Delhi-based international bodies — Italian Embassy Cultural Centre and Korean Cultural Centre. The fair programme will reflect upon the changing face of the global art community with Forum, a platform encouraging opportunities aimed at the younger generation. London-based writer, researcher and curator, Sitara Chowfla, who will be this year’s guest curator, will work on critical experimentation and the work of artists, curators, institutions, critics and collectors across the globe. The platform will include performances and talks by international artists, extending into the main gallery halls with Forum Projects, including When All Roads Are One by New York-based artist and designer Ghiora Aharoni. A new initiative IAF Parallel will see collateral events programmed by galleries, museums and arts spaces across the city. The main highlights of the section include artist Bharti Kher’s solo exhibition at Bikaner House; an exhibition-launch dedicated to artist Upendra Maharathi at the NGMA; artist Arpita Singh’s retrospective at KNMA; and a special exhibition by Foundation for Indian Contemporary Art (FICA) at the IGNCA. Among the major art galleries showcasing, there will be Chatterjee & Lal, Jhaveri Contemporary, Galerie Isa, Project 88, Chemould Prescott Road, Sakshi Gallery and TARQ, Exhibit 320, Nature Morte, Shrine Empire and Anant Art, Kalakriti Art Gallery, Experimenter, Galleryske, and ZOCA. 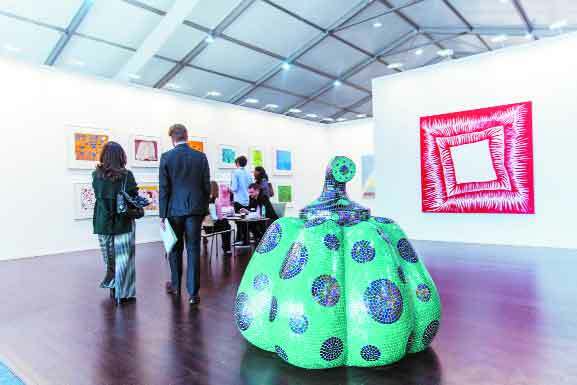 Among the international galleries, there will be David Zwirner from London, New York, Hong Kong; Blain | Southern from London, Berlin; Aicon Gallery from New York; Lukas Feichtner Galerie from Vienna, Austria; 1X1 Art Gallery from Dubai; and Arario Gallery from Cheonan, Seoul, Shanghai. The first-time participating international galleries include neugerriemschneider from Berlin, Germany, and Sokyo Gallery from Kyoto, Japan.